This warning sign lets people know that algae counts are high and the West Monponsett Pond is closed to fishing and water recreation. The earliest the area could open is next weekend, Friday, July 31, if algae cell counts are below the state ceiling of 70,000 cells/ml. Photo by Express staff. The Halifax Board of Health has closed West Monponsett Pond to fishing, boating and water recreation in the wake of an algae count slightly higher than the level recommended by the Commonwealth. The BOH tests the water of each pond weekly on Tuesdays, with the results back to the town on Thursdays. The last test showed West Monponsett Pond at 75,000 cells/ml, slightly higher than the maximum recommended of 70,000 cells/ml. In order for the lake to be reopened for recreational water use, the lake must have two consecutive tests showing less than the 70,000 cells/ml ceiling. The next test will be Tuesday, July 28, with test results coming back sometime Thursday, July 30. If those results show less than 70,000, the Halifax Board of Health may then open West Monponsett Pond for the weekend of August 1. East Monponsett Pond remains open for fishing and boating. 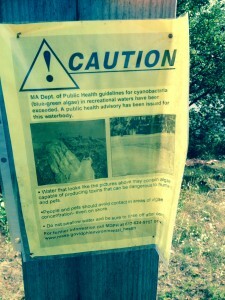 Town Administrator Charlie Seelig told the Express he hopes that the three recent treatments of West Monponsett Pond, the final one on Thursday, July 23, will help control the algae bloom problem this season. Last year at this time the counts were in the millions and the lake shone with a neon green effervescence. Asked if he credits the aluminum sulfate treatments with the difference, he was reluctant to give the treatments all the credit. “Cooler weather and more rain to keep the lake moving also help keep the algae count down,” he said. Aluminum sulfate added to the pond combines with phosphorus, a natural mineral which is also used in fertilizer and some detergents, to make it unusable as a nutrient to promote algae growth. The three treatments appear to be having some success. He is cautiously optimistic. “These treatments are more a long-term solution,” Seelig said. Wednesday afternoon a trailered boat was backing up to launch despite the warnings.